... that is, if you trust this guy. For my friends and family who worry about me on the trail in the midst of winter chill. I have the same gear that people use to climb Mt. Everest and trek across Antarctica. No, I wasn't wearing any of it in this photo - it wasn't cold enough. That was taken two days ago. Today, though, I broke out the Mountain Hardwear Conduit SL SubZero down coat, the crampon-resistant gaiters (but not the crampons nor the double plastic Koflach Degre mountaineering boots), and the thick Balaclava (face mask) I bought in Fairbanks, AK. That keeps all those icicles from forming on my ever-growing beard. I had my Smith Ski Goggles along too, but didn't have to put them on. I wasn't going to hike today (Saturday Feb. 11th), but it turns out that the snow wasn't as deep as expected. (The weak link in my gear is my vehicle!) 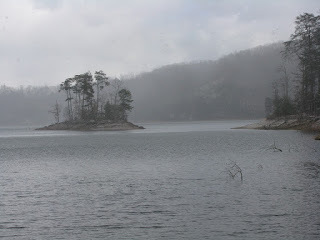 I picked a major highway (US 321) to park at, and hiked along Watauga Lake with some great views from the several 'fishing camps' that dot the shore along the AT there. Then I made the 1800 foot climb up Pond Mountain to Pond Flats. Yes, there actually is a natural pond up there on the top of the mountain - a geological rarity in this non-glacial terrain. I didn't start hiking until 2PM, waiting for the roads to improve. 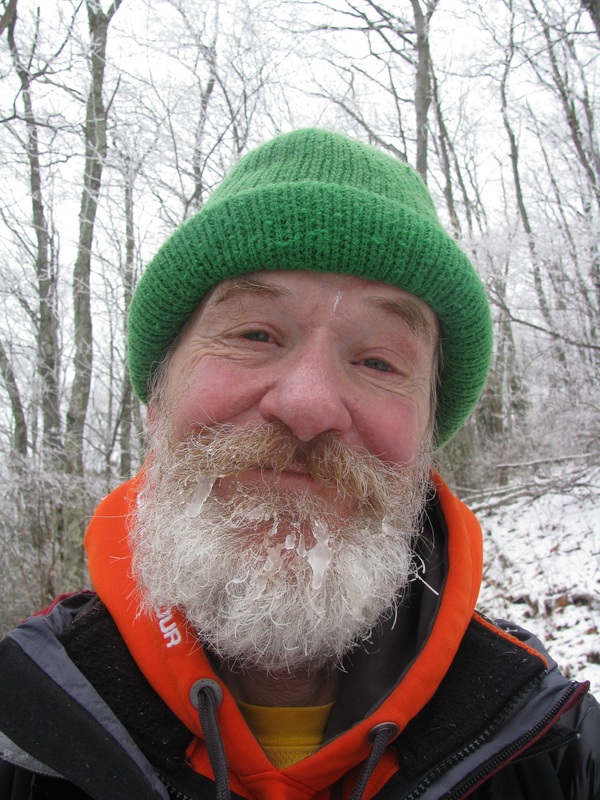 The winter weather advisory continues until 6AM tomorrow, so we were still getting snow squalls, and the wind was biting at times, but I was glad to be on the trail - and entirely cozy with my gear. On the way up Pond Flats I met a couple guys that didn't seem to need any gear - just looking for a hand-out. Friendliest horse I ever met, and ditto for the goat, who reared up and tried to compete with his bigger buddy for attention. Since I had nothing to feed them, the horse chose to just nibble on my hand every chance he got. What a couple of cuties. Further up the mountain there was this nice 'retrospective' view of where the AT took me yesterday - across Watauga Dam and then along the left shoreline of the lake. I only got in 9 miles of hiking today, and the morning off felt like a mini-vacation, but I was glad to have the chance to try out some new gear combinations and 'stretch my legs'. Weather is supposed to improve tomorrow. Winter doesn't seem to have much staying power this year, and soon the sun will be high enough here in the south to begin to beat it back. Any snow that falls now is not likely to last very long - at least that's my theory.